The Hornets, reduced to 10 men, battled their visitors until the final whistle but left with nothing to show for their efforts as the Gunners discovered a new way to triumph away from home. 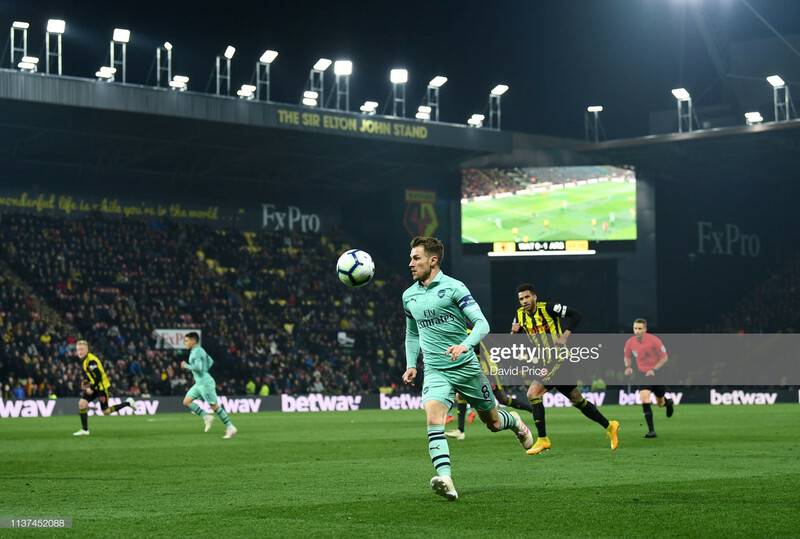 Under the lights at Vicarage Road, Arsenal returned to the top four as a first-half strike from Pierre-Emerick Aubameyang sunk a mettlesome Watford side who, despite playing the best part of 80 minutes with a men less, arguably merited more from the game. The decisive goal was not one of the technical quality which may be associated with the Gunners, but it was a case of dogged endeavour as Aubameyang chased down a surprisingly calm Ben Foster to tackle the ball into the open net. Minutes later, Hornets captain Troy Deeney saw red for a perceived elbow on Lucas Torreira, as two bizarre moments looked to cast proceedings out of the hosts' reach. Far from it, however, as Watford continued their tenacious pursuit of a result and forced their opponents onto the back foot for large periods of the game. They had chances to even the score, but Arsenal weathered the storm and escaped the siege unscathed to secure their first away clean sheet of the season and, crucially, a vital thee points in their race for Champions League qualification. While the opening 10 minutes appear less eventful due to the mayhem which later ensued, it's important to note that the hosts in fact started the brighter of the two sides. Watford knocked the ball around with the confidence and adventure of FA Cup finalists and, as such, the two impending errors conjured the impression of a preventable yet harsh route to certain defeat. First, the Hornets recycled possession in their own half as Daryl Janmaat passed back to Foster. The 35-year old — an imperial performer and one of the key cogs in his side's successes this season — let the ball run across his body with a heavy touch and, in the blink of an eye, felt the brush of the wind as Aubameyang nipped at his feet to score. Having initiated proceedings so well, finding themselves a goal down in the strangest of fashions was shock enough for Watford, but the true kick in the teeth came when Deeney was sent off as an off-the-ball collision with Torreira was deemed malicious on the former's part. Did the red mist descend for a man whose comments in October 2017 have sparked something of a grudge match between the two teams? Replays are inconclusive and the incident divides opinion, but it was a needless act from Watford's talisman, and one which looked to be the final early blow for the hosts. Numerical advantage in football cannot be underestimated. The opposition tire as the task of marking the spare man is juggled from one beleaguered player to another and rare spaces of play suddenly become of use. After Deeney's dismissal, Arsenal enjoyed these benefits, but reaped no further reward as their hosts remained fortified in defence and just as vivacious in attack as they had been before the sending off. The Hornets began to draw set-pieces in an apparent display of tactical nous from Javi Gracia, who doubtless realised how difficult it would be to break down a four-man defence with just one striker. Craig Cathcart and Étienne Capoue both came agonisingly close from these scenarios, forcing awkward saves from Bernd Leno. Arsenal could exploit the space on the counter-attack and looked threatening doing so, but their chances were limited. Cathcart and his centre-back partner Christian Kabasele defended impeccably well but, on the other hand, a lack of cutting edge in the final third left the Gunners ruing a number of missed chances which they would be expected to take. Following a nervy period, Arsenal steadied the ship and grew back into the ascendency towards the end of the first-half, but the Hornets resumed their endeavour after a break which, according to hindsight, remarkably energised them. To reduce the strain on combative midfielders Abdoulaye Doucouré and Capoue, attacking responsibility was handed to the full-backs. Janmaat made surging runs infield and Adam Masina was equally effervescent on the left, notably striking the crossbar with a thunderous first-time strike from 25 yards. Again, this left the Gunners with a less complicated route to goal once they regained possession, but it was a risk worth taking for Watford who capitalised on their opponents' waste in front of goal. Chances were few and far between for either side — Henrikh Mkhitaryan had Arsenal's best but it was expertly saved by Foster, while Ainsley Maitland-Niles bravely prevented Andre Gray from scoring at the other end — but both looked intricate in attack, and it's testament to the Hornets that they were able to keep up with Arsenal despite their less than ideal circumstance. This is a historic season for Arsenal, their first since Arsene Wenger's acclaimed 22 years at the helm, but any positivity emanating from the work of his successor, Unai Emery, has often been overridden with criticism of the team's poor performance away from home. Victory over Watford earns them just their second away league win in 2019 and brings equal their win and loss tallies on their travels but, more importantly, it shows that the Gunners are indeed capable of the manner of display they have often lacked in past away games. It wasn't pretty and it was far from spectacular, but it was the required formula on the night. Arsenal were guilty of looking shellshocked when their opponents refused to lie down, but they hung onto their nerve in a game which they could so easily have lost in previous seasons, or even previous weeks. Of course, they benefitted from two colossal errors from the opposition — gifts, from their own perspective — but the result alone is nonetheless an encouraging sign for Arsenal. There are some occasions when it doesn't matter how you get there, as long as you do. Emery's reign is a process, the reconstruction of success, and this could well be a step in the direction of realisation. Watford should be commended for their performance but, in truth, Monday's loss is somewhat harmful to their quest for Europa League qualification. Given that fellow contenders Leicester City, Everton and Wolverhampton Wanderers all trundled to defeat at the weekend, victory would have put that requisite 7th position in Hornet hands. While they still have a game in hand over the former two, the latter are now in the driving seat to secure the spot, making the meeting between Watford and Wolves on April 27 a possibly decisive encounter. Until then, though, the Hornets visit already-relegated Huddersfield Town where they will be seeking to improve their goal difference in conjunction with their points tally. Southampton visit Vicarage Road on the following Tuesday, and Watford round off the season with a trip to Chelsea a week before hosting West Ham United on the final day. Meanwhile, alongside their current Europa League ambitions, Arsenal's quest for entry into next season's Champions League looks yet more credible. They'll hope to make it 11 league home wins in a row against Crystal Palace on Sunday before facing trips to Wolves and Leicester where they may do favours for their opponents here. The Gunners then host relegation-threatened Brighton & Hove Albion before travelling to Burnley on matchday 38. A seemingly straightforward run-in for a top six side, but Arsenal will have to watch their step in visits to the King Power and Molineux Stadium which have the potential to be the sites of fatal blows to their European aspirations.